Do you want to escape into a slightly less dystopian world right now? You got your steampunk in my stealth action! You got your stealth action in my steampunk! hey aren't you corvo, hero of dishonored 1? hey aren't you emily, daughter of the empress from dishonored 1? I will play through this game 1 time and it will be as Corvo! V excited to return to form as the murderous rat king. Even if the remaining levels are so badly designed that I find them intolerable, and there’s absolutely no reason to believe that would be the case, I’ve already explored enough beautifully realised and densely packed areas to see this as a sequel that understands what its predecessor did well, and knows precisely how to do it better. Here, with no spoilers, are my thoughts on what I’ve seen so far. The best level design in the business wouldn’t be worth a damn if the spaces weren’t enjoyable to navigate, and before getting on to what feels fresh here, it’s worth reiterating a few points about the original Dishonored. It brought kinetic energy to the first-person stealth game, allowing protagonist Corvo not only to bampf across city blocks like a murderous superhero, but providing all the tools necessary for escape, concealment, confusion and acrobatic combat. 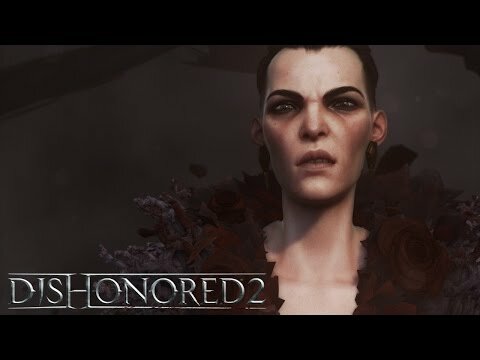 Stabbing and slaughtering your way out of a situation often feels like an unsatisfactory last resort in stealth games – all the ingredients for the perfect steak were there, but too much slicing and dicing left you with a casserole – but Dishonored went some way toward making violent alternatives satisfying. The perfect non-lethal, ghosted playthrough is still a worthy ambition but improvising with sword, pistol and razor-traps isn’t a dull or ineffective enough solution to make an instinctive quickload occur as soon as a guard raises the alarm. All of that has returned, with a new selection of lethal and non-lethal options, as well as additional ways to navigate the scenery. As in the first game, there’s an occasional helping hand, with the aiming tips for the teleportation skills and the like, but movement is manual- there’s none of the automated parkour of Assassin’s Creed here. That can make for uncharacteristic clumsiness on the part of the protagonists, but the precise control it provides is precious indeed. And, yes, on current evidence, the pleasing flow of movement is matched with some of the best level design in the business. wait how was daud's blink different again? Daud aims in frozen time. Vincent D'Onofrio is voicing the Duke of Serkonos! Hm, Steam ratings don't look so hot. I'm gonna buy it because I want it, but has anyone been having any major issues on PC? I've just been reading that the framerate on PC ahead of its Day 1 patch has suuuuuuuuucked. The patch isn't out as far as I know. Might fix it, but there's still the niggling thought of this following Bethesda's new review practice. I know all my letters, and then some! They've officially noted that they are working on a fix for those having performance problems on PC. so what are the new powers, etc, in this one? It's out on consoles but...not on PC yet? Her blink is so awesome, you can use it to launch yourself into the sky. Used the VPN to unlock this early yesterday and played for a few hours. Definitely some random framerate drops going on in places, so hopefully that gets patched soon. Otherwise, first impressions are really strong. The levels seem so much larger and more intricate than before. I had the exact same experience as the RPS writer in that I spent a ton of time in prologue only to discover at the end I had missed more than half of the stuff. I've totally done both of those things. Although I think with sitting people you automatically stand them up and chop them in the neck first. I finally get this downloaded, and there isn't time to get stuck in. Bah. I did the tutorial at least, and it ran fine on Ultra settings for me. When're the big areas that really show how bad it can get? Level 1, 2, what? I'm running a GTX 970, but I've got 24GB RAM in there (it was stupidly cheap when I was getting my computer, so I just said to hell with it, give me all the RAM), so that might be the bottleneck a lot of people are getting. I had a similar experience with Arkham Knight, it always ran okay for me. I've had to reach over someone's shoulder to grab a glass off their desk to smash so they would stand up and I could strangle them. Definitely couldn't do it, at least for some chairs. I'm running it on 1440p on a 980 and I'm struggling to get about 40FPS most of the time when outside. That by itself isn't a huge deal (though obviously I'd prefer a solid 60) but it seems like the y axis of mouse movement is tied to framerate, because when the framerate is up and down instead of solidly low, my mouse controls go completely wack. It's real fun, but I'm waiting for a patch or driver update to see if I can eek out just that little bit more performance to clear up those issues. Interestingly enough, none of the options seem to do anything in terms of performance. Turning everything on low gets me about 10fps on average, but it doesn't fix the problem of the framerate jumping around.